The Clean Air Act and climate change-related policies are under attack from all sides in D.C. this week. In an ongoing showdown, the House Energy and Commerce Committee is considering Chairman Fred Upton's (R-MI) "dirty air" bill. Meanwhile, the full House is pulling climate regulations and clean energy investments into a fight over the budget. Rhetoric suggests that the Clean Air Act and climate policy generally will continue to be points of contention throughout the upcoming budget process. In the coming months, it will be critical for President Obama and leaders in Congress to stand up to these big polluter-led attacks with a full-throated defense of the Clean Air Act. 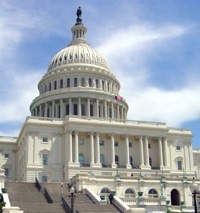 The FY 2012 Budget: Funding the government from October 1, 2011 through September 30, 2012. Chairman Upton's new "dirty air" bill targets the Clean Air Act, halting updated green house gas regulations for big polluters like Dirty Coal and Big Oil. Timing: The House Energy and Commerce Committee may vote on the bill as early as next week. From there, it could make it to the House floor, where it is likely to pass, in a matter of months. Climate Implications: This bill is the primary vehicle for polluter-led attacks on the Clean Air Act and climate policy. Fighting this battle in the House is key. The Obama Administration has promised a veto threat, so a stand-alone bill is unlikely to become law; nonetheless, parrying legislative attacks on the Clean Air Act will be crucial for demonstrating support for strong enforcement from the Obama EPA. Obama's veto threat does not encompass anti-Clean Air Act riders, like amendments to spending bills. Upton's role as Chair of the Energy and Commerce Committee makes this the most serious in a string of House-initiated Clean Air Act attacks. The draft bill is called "The Energy Tax Prevention Act," released in partnership with anti-climate crusader Senator James Inhofe (R-OK). Upton's Subcommittee on Energy had a hearing on the the bill last week where EPA Administrator Lisa Jackson faced down her critics and defended her work under the Clean Air Act. What has been said from the White House is that the president's advisers would advise him to veto any legislation that passed that would take away EPA's greenhouse gas authority. Nothing has changed." She has kept her message strong in the face of harsh criticism. The so-called "continuing resolution" or spending bill would fund the government from March 4 through September 30, 2011. Last year Congress failed to pass an appropriations bill, leaving the government funded by a so-called "continuing resolution" at 2010 levels through March 4, 2011. The new proposed resolution includes massive cuts to regulatory agencies, clean energy investments, and a section that cancels Clean Air Act regulations for big polluters. Timing: The GOP-led House has a spending bill ready for floor consideration this week. The March 4 deadline will likely be extended by the Senate. Climate Implications: The House spending bill includes a provision that would block updated Clean Air Act rules for big polluters. The Senate won't likely include this language in their bill, and the House leadership won't risk a government shutdown to make sure it's included. This is a threat to the degree that the Senate or President Obama compromises over short-term budget cuts to climate and clean energy programs or anti-Clean Air Act riders. The spending bill proposed by House leadership would cut total FY 2011 spending by $61 billion. This bill was proposed after a week of internal wrangling over budget math in hopes of hitting the somewhat arbitrary target of "$100 billion in cuts." Overall the bill would put a halt to Clean Air Act climate rules and cut investment in clean energy programs by 30%. The Center for American Progress has a detailed analysis of the cuts and their implications. Analysis from the Obama Administration suggests broad implications for such drastic cuts in funding, including widespread uncertainty for major clean energy projects resulting in "thousands" of lost jobs. The GOP's bill would cut the EPA's budget by $3 billion dollars. The FY 2012 budget is a draft for funding government programs from October 1, 2011 through September 30, 2012. Obama's 2011 State of the Union and proposed FY2012 budget lay out his opening bid in the ongoing fight over future federal appropriations for climate-related policies. Timing: The president released his budget this week. House and Senate Budget Committee debates will kick off in another couple of months once the House releases their budget. Climate Implications: President Obama's budget includes increases in clean energy investments and increased oversight budget for the EPA to effectively administer updated Clean Air Act rules. The budget committees will set the overall size of the pie, and then appropriators will decide how it's divvied up. Like the 2011 CR, much of the final package will be dictated by compromises reached in the Senate or compromises made by the Obama administration. Overall, President Obama's FY2012 budget cuts subsidies for fossil fuels by $3.6 billion while increasing clean energy investments by $8 billion. The budget included small cuts to many programs, but modest increases to climate and clean energy programs. Under Obama's plan, the EPA's budget would be cut by $1.3 billion but the climate budget within the EPA would be increased by $46 million, up from $140 million. Unfortunately, in addition to clean energy investments, the budget also includes $36 billion in loan guarantees for new nuclear power. Obama's new budget lays the foundation for a broader plan to spend $53 billion on high speed rail over next six years.